Is Colloidal Silver An Effective Treatment For Acne? As part of my intensive research for a permanent acne cure I have also tried and experimented with Colloidal silver both externally and internally so read on to learn about my conclusions. Colloidal silver is silver that was processed into suspended submicroscopic liquid silver particles in a colloidal state. The liquid silver particles are so small human cells can easily absorb them and in the same way they enter cell walls they can easily exit the cells and since excess silver particles are quickly expelled from the body, colloidal silver will make its impact without poisoning your system. In recent years, colloidal silver products have been manufactured and marketed claiming they can have a significant positive impact against hundreds of known chronic health conditions such as AIDS, cancer, infectious diseases, chronic fatigue, enlarged prostate and of course acne. Because the any contact of colloidal silver with any bacterium, virus, and fungal organism quickly neutralizes its oxygen metabolism enzyme (its chemical breathing system so to speak), any single celled pathogen will shortly (in a matter of minutes) suffocate and die and quickly expelled from the body with the help of the elimination organs, the lymphatic system and the immune system. The prominent upside to colloidal silver is that unlike antibiotics that destroy everything in their way, including tissue cell enzymes and good bacteria, colloidal silver can differentiate, so to speak, between single celled life forms like viruses and tissue-cell enzymes, which it leaves intact. Although this unique property seems to make Colloidal silver safe for humans to use, colloidal silver treatment does not come without side effects. Scientific studies have found that long term use of Colloidal silver may result in a condition called argyria, where silver salts deposit in the skin and eyes including internal organs, making the skin turn ashen-gray. Although Colloidal silver can effectively kill the acne bacteria as it kills viruses and any other single celled pathogens, and despite it being able to leave the good cell tissues intact, unfortunately, colloidal silver is not effective against acne as it doesn't fix the internal cause of acne. 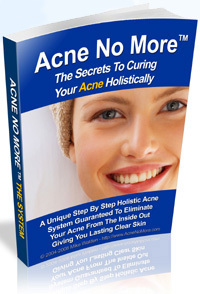 Killing acne bacteria using benzoyl peroxide, antibiotics or any topical acne treatment, be that an over the counter or prescription medication, or even a natural solution like colloidal silver will not cure your acne since it only deals with the symptoms of acne (or the manifestation of acne on your skin) and not with the root cause of the disease. The only way to permanently eliminate acne is to tackle acne from the inside by neutralizing all acne contributing factors, holistically.